Too many respond to increased competition by lowering prices. The problem is that lowering the price often comes with unintended consequences. It can lower the image of your product and send the wrong message to customers that recently paid more. What is a company to do? The answer is set the price at the right level by finding out what buyers are willing to pay. Pricing novices tend to be "inside-out" thinkers. They assume that buyers always want to pay less because they, themselves (inside their own heads), want to pay less. What the data shows is that this is true if the product is validated. If you know and trust the company and the product you are buying, of course, you would like to buy it for less. What if the product is not validated? You never heard of the company, or you have never heard of the product. Time and again, a lower price for an unknown product from an unknown company usually means one thing to the buyer's brain - the product is probably not very good. Economists tell you that the market determines the price, and that an economic price is where supply equals demand. Rather than fight with economists, good Marketers know that positioning (product branding) gives you control over the price. The more uniqueness and desirability you put into your positioning strategy, the more control you have over the price you can charge for your product. A few examples should help to illustrate how positioning gives you this control. Record-breaking baseball. A baseball sells for a few dollars. The baseball that Barry Bonds hit in the stands to break Hank Aaron's home run record sold for $752,467.20. It was unique, and desired by the man that bought it. Apple's smartphone profits. Even if the iPhone has only a 12.1% share of the smartphone market, Apple commanded 91% of the smartphone profits in the 3rd Quarter of 2016. 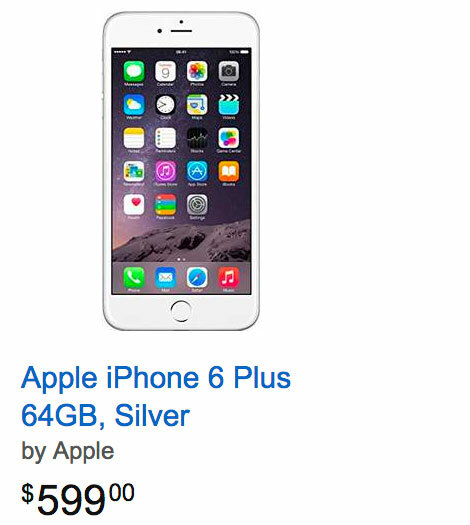 If you want and iPhone, only one company makes it - Apple. If you want an Android phone, there are a number of choices. Entertainment venue food and beverages. When you go to see a popular professional sports team in a stadium or a movie or concert in a theater, you might notice that the price of candy, popcorn, hot dogs and other items is considerably higher than if you buy them outside the venue. Why? Even if the items themselves are not unique, they have uniqueness because the distribution channel you are in has no competition nearby. If you want to eat or drink something, you have to buy it from the venue at the prices they charge. Once you understand that positioning gives you control over the price, you are ready to develop pricing strategies to help your sales and profits. Pricing is more complex than you think. Pricing is one of the fundamental building blocks of marketing. Many believe price is easy to understand when, in fact, it is one of the most difficult. McKinsey points out in an article entitled Shedding the Commodity Mind-set, too many companies leave large amounts of money on the table. Pricing experts know that setting the right price is difficult because, in addition to the physical factors of cost and profit, price is subject to psychological factors. The best companies can do to have control over these psychological factors is to do a great job of branding. And to get the branding right, companies have to know how to develop the right underlying corporate image and positioning strategies. In short, creating a brand image of the product that is impossible, or extremely difficult, to copy is the key to having control over your pricing strategies. If you are able to do that, you will be able to employ the most powerful and effective of all pricing strategies - What The Market Will Bear (WTMWB). In markets where there is little or no competition, companies can employ a pricing strategy that optimizes profits. It is often called a What The Market Will Bear (WTMWB) price. This strategy sets the price based on the maximum price the market will pay for the product. On the one hand, the company wants to realize the highest profits possible in the shortest amount of time to help recoup high start-up costs, such R&D (research and development), production, and marketing costs. On the other, it may not want its profits to be so attractive as to entice cutthroat competition to enter the market within the time window it needs to build market share and establish a leadership position. This strategy typically works because those likely to buy a new product - the Innovators and Early Adopters - are not particularly price sensitive. If there is considerable uniqueness and desirability built into the product brand, your company can employ a WTMWB strategy. If not, you might consider other effective pricing strategies. In almost all cases, pricing strategies should begin with a Gross Profit Margin Target (GPMT) strategy. Companies typically know the gross profit margin they need to pay back their expenses and generate positive net income and cash flow. Once your company knows the cost of sales (cost of goods and services sold) of a particular product and the Gross Profit Margin Target it wants, it can easily employ a GPMT strategy. 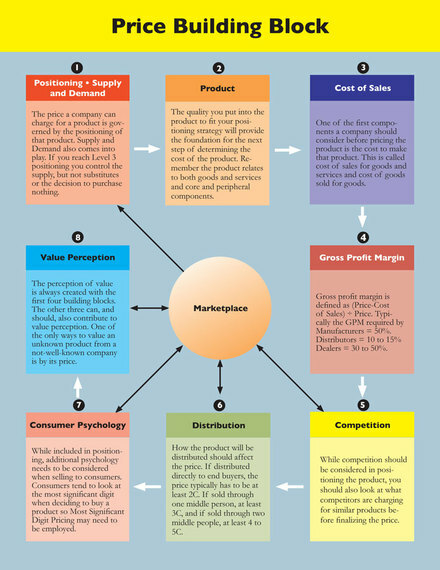 Gross Profit Margin is defined by the formula (P-C)/P, where P=Price and C=Cost of Sales. Anybody can put this formula into a spreadsheet program, and as costs change, recalculate the price that will produce the targeted Gross Profit Margin. Most companies know the GPMT they want. If you don't, there are some common guidelines you can follow. Dealers (Retailers) require a GPM of 30 to 50% (the higher percentage is for retailers that have to train people (customers and employees) to use the product and the lower margin is for retailers that are selling a product that does not require after-sale support. Dealers: P=1.5C so the formula is (1.5C-C)/1.5C, for a 33% GPM. When I develop pricing strategies for a client that is a manufacturer, I always start with a GPMT pricing strategy that is twice their cost, or 2C, since that is an easy calculation that will give them their GPMT of 50%. For products that will be sold to consumers, most companies employ a Most Significant Digit (MSD) pricing strategy. Why? Studies and experience show that sales will be significantly higher if a product is priced at say $29.95 or $29.99 instead of $30. Most humans focus on the most significant digit - the "2" in this case. To them $29.95 or $29.99 seems a lot less than $30 even though it is only 1 to 5¢ less. Even expensive homes in Beverly Hills might sell for $7,995,000 rather than $8 million. There are exceptions. In upscale restaurants, it is usually a mistake to price an entrée at $31.95. Instead it will be priced at $32-. For some reason, people do not think the food is as good if MSD pricing is used in a high-end restaurant. If a product is positioned as unique, smart marketing companies will typically use all three of these strategies in combination. For example, Apple has priced its iPad Air and iPad Pro starting at $399 and $599 respectively. Apple is using a MSD strategy in addition to a WTMWB strategy because the iPhone has uniqueness built-in since Apple controls the platform. It also aims for a GPMT, which is not officially published, but which is in the 30 to 50% GPM range of well-positioned products in competitive markets. When Johnson & Johnson launched a margarine developed in Finland that lowers cholesterol, it priced a tub of this margarine at between $5.79 and $5.99. At the same time, a tub of regular margarine sold for 99¢. Based on this pricing, which used MSD and WTMWB strategies, many speculated that J&J priced the product at 8C, which gave it a GPMT of roughly 87.5%. When you are pricing your products, what gives you control over the price is the uniqueness and desirability built into your positioning, or branding, strategy. If you have created a product image that is impossible, or very difficult, to copy, you can employ a WTMWB price that will give you a good GPM that enables you to achieve your desired GPMT. And, if you sell your product in a consumer market, it would be a good idea to also employ an MSD pricing strategy. For example, if you are a manufacturer that is targeting a GPM of 50% and your cost of sales is $15, you might consider selling the product for $29.99 - a penny less than the price of 2C, which would give you a 50% gross profit margin. Best of luck.